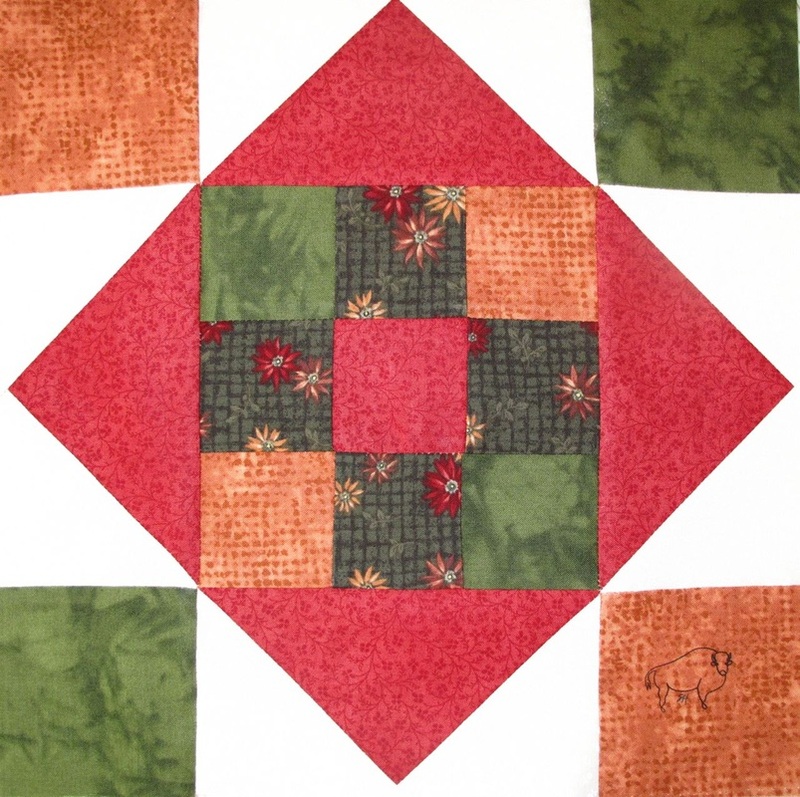 Every month one or two club members will bring a 5" focus fabric square to give to each of the other club members. 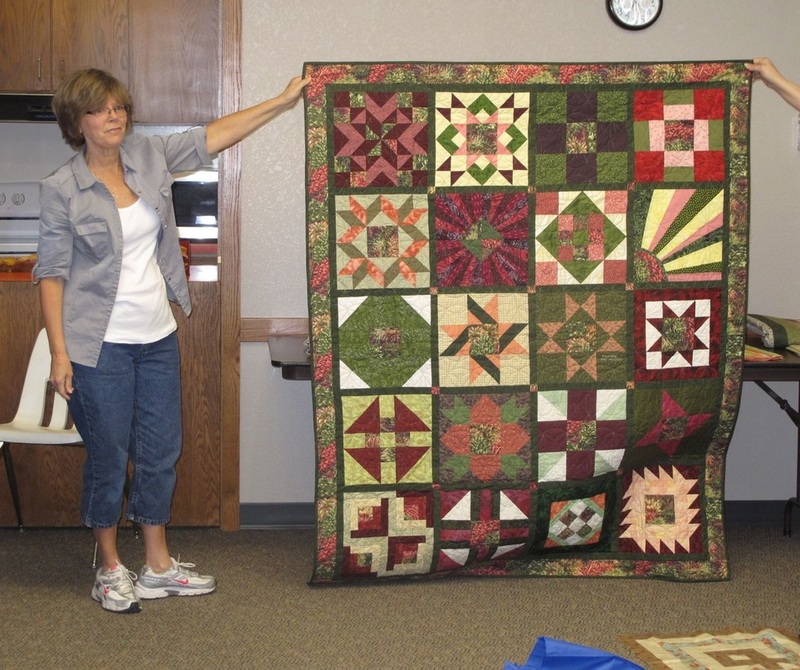 By the next meeting, the club quilters will make a 12" finished block to give to the birthday person. The months listed in the calendar are the members that are to bring the square that month. 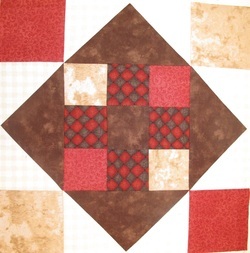 I have chosen to make the block "Comforts of Home" for my donation to each quilt. I will add a photo for each of the blocks that I made and a few comments as I made them. 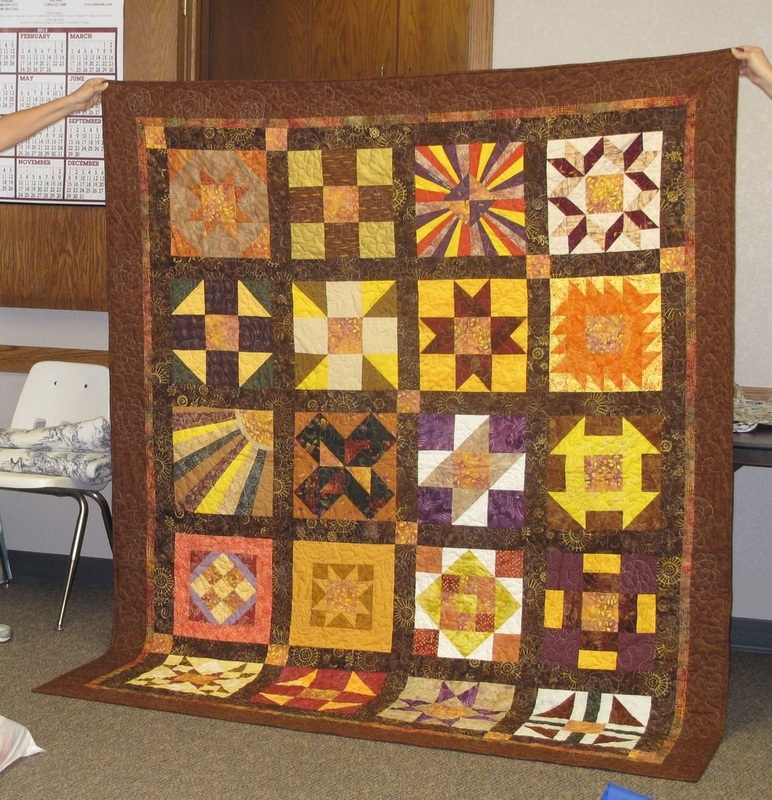 I can't wait to see the blocks that the other club members make and then see the finished quilts. 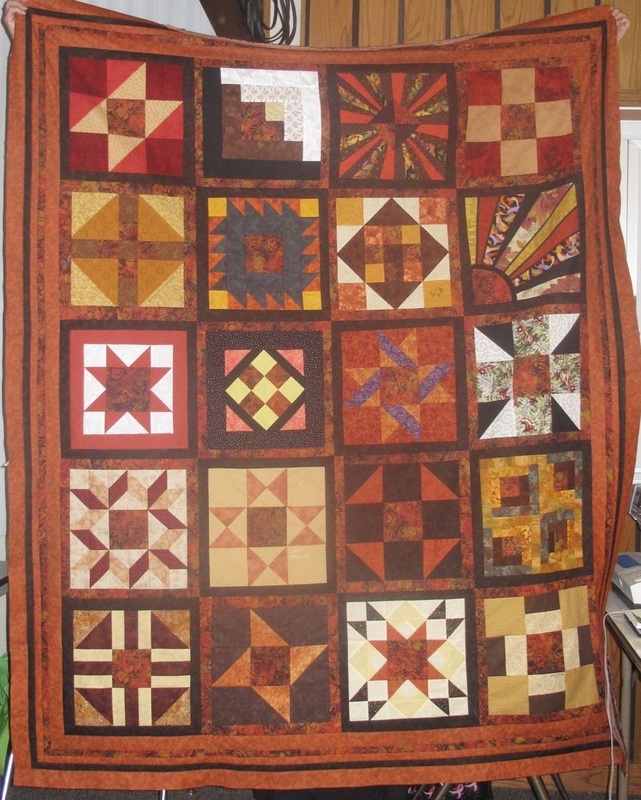 As one is finished I will replace my block photo with the finished quilt photo. Check out the photos of the show at the Meadowlark Art Gallery located at the bottom of this page. 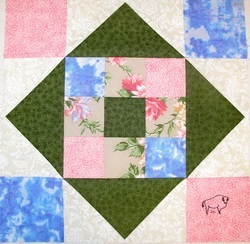 Mary chose the floral piece for her quilt. 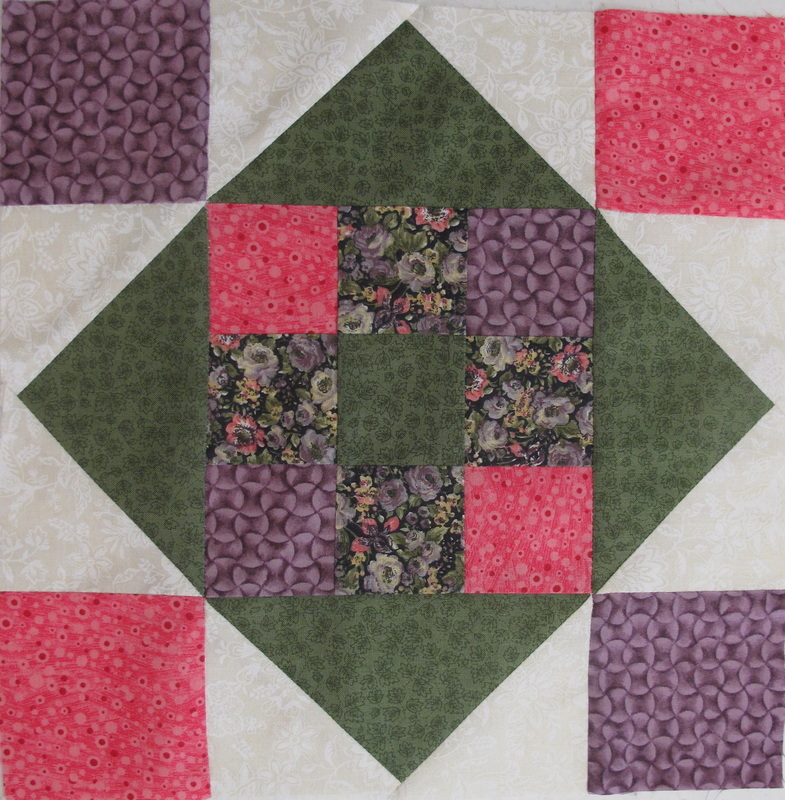 I searched through all of my stashes and found that I hadn't made many quilts using purple. If I did, I had cut the pieces into my 1 1/4" squares for quilted mosaics. I had to make a trip to the fabric shop for the purple fabric and decided to get a better green, too. The great thing about this was that I organized my stashes and ended up with some room in my cupboards in my studio. The focus fabric Sally gave us is the gold and cream Art Nouveau spiral piece. She shared that anything goes but that she didn't really want Christmas. Because of no actual colors in the focus, I can only guess what colorful blocks will emerge. 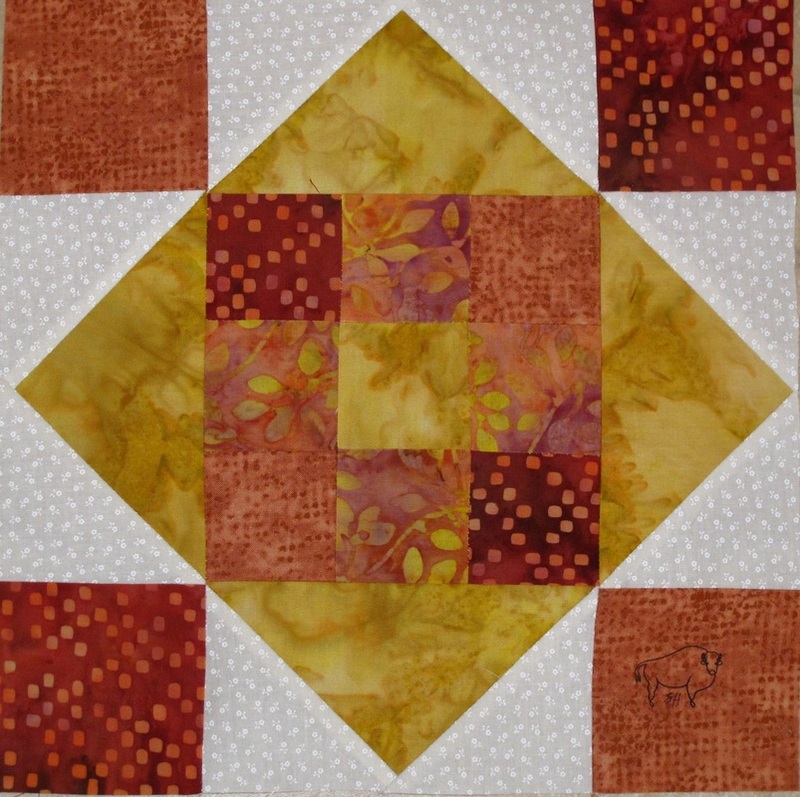 My block changed from my initial layout - When I saw that Pennie had put some metallic pieces in, I decided to search in my metallic stash (I love them) and use some pieces, too. The photo doesn't do it justice. Can't wait to see this one with everyone else's! 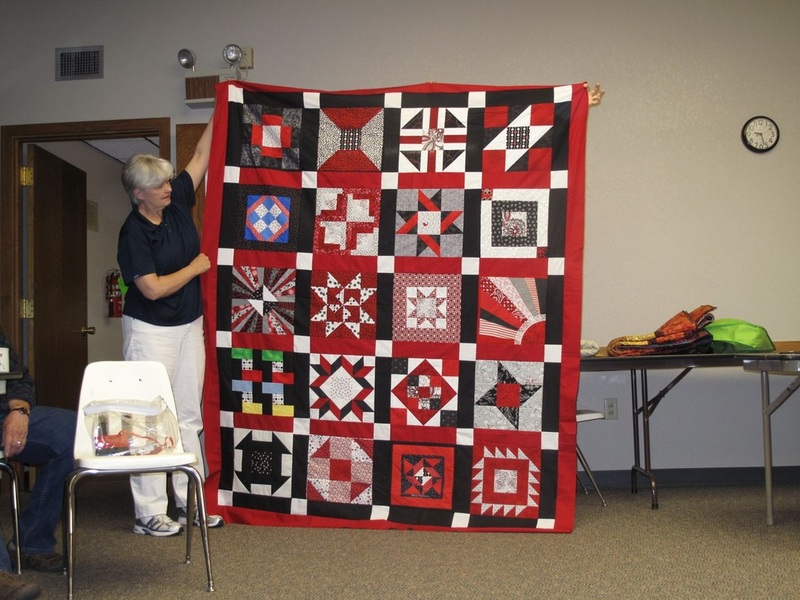 Mary brought a charm pack with the red, white and block designs and let everyone pick the one they were going to use. 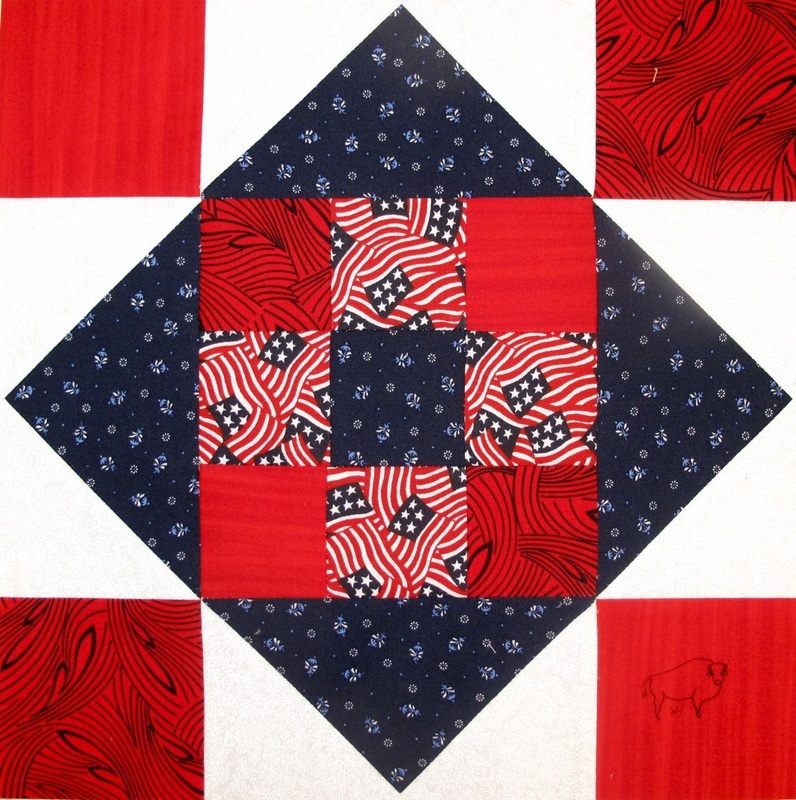 These colors are very striking in a quilt and will be varied because the focus fabric for each will be a little different. 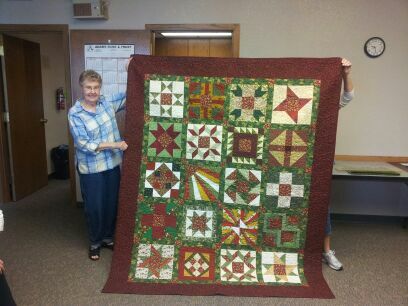 Mary has created her finished quilt top. 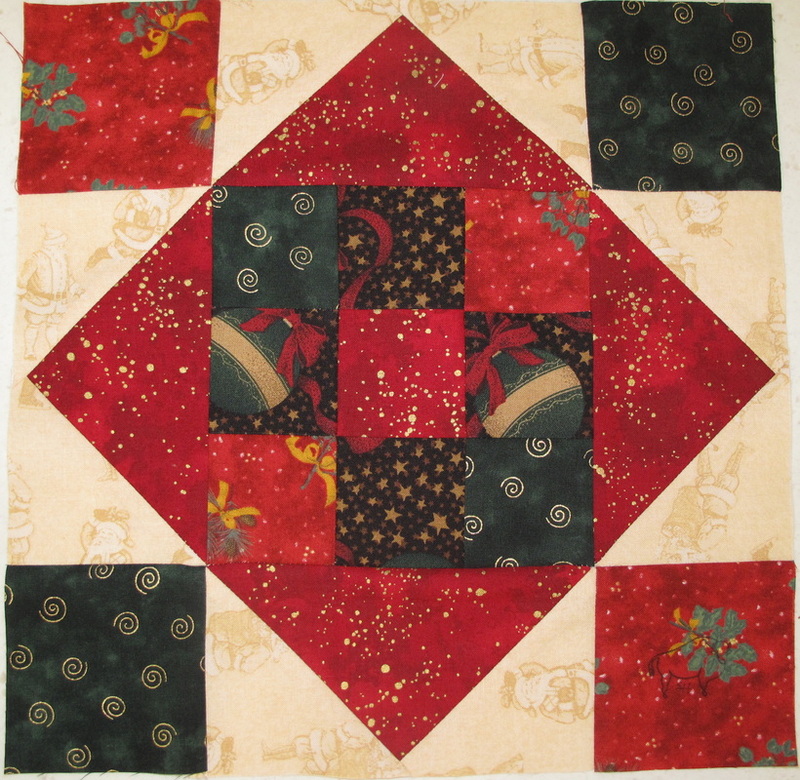 Iris chose a Christmas theme for her birthday block. The colors in the charm pack included dark green, dark red and black. 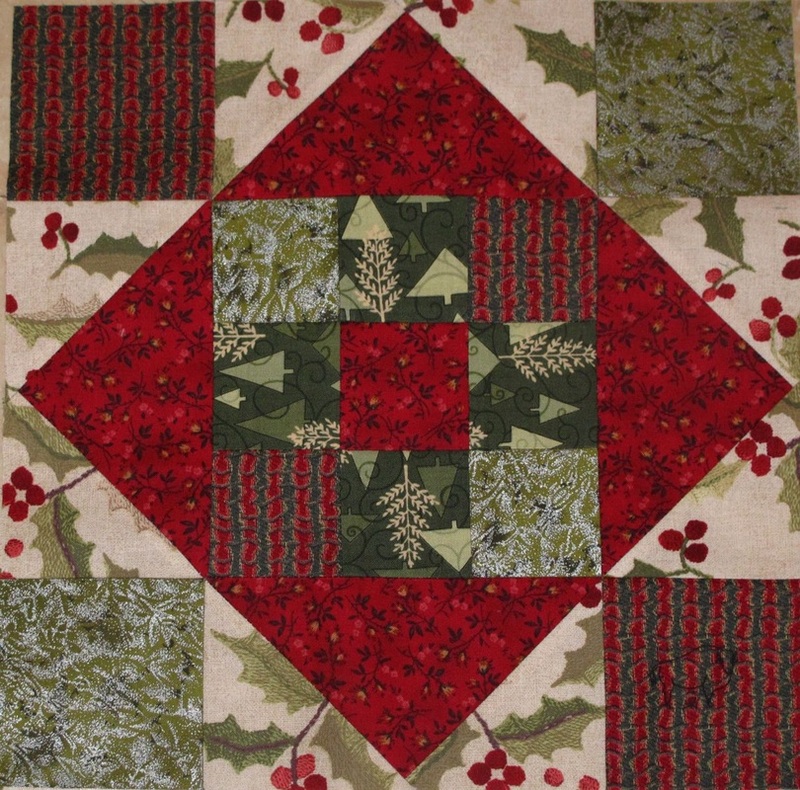 It was fun to work with my stash of Christmas fabric to come up with this square. I added some metallics, too. What is Christmas without tinsel! 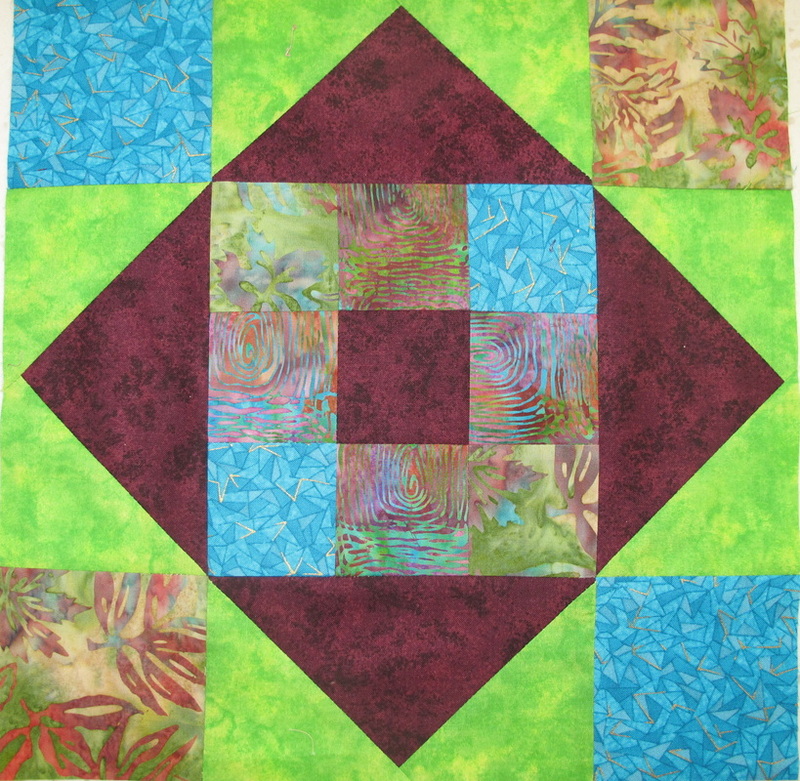 Ann gave the birthday group a 5 inch square that had a dark/medium green checked background. The foreground included rust, dark sand and tan flowers. 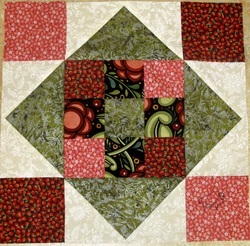 It was fun to get into my stash and pick fabrics to match the colors in the focus square. 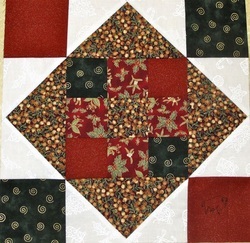 Linda shared a flannel charm pack with the group. I chose a medium tan and cream plaid. Linda said that she liked fall colors - not Halloween - so I chose from my fall leaf fabric that I am using for my all day quilt - "Only on Sunday". There is a metallic leaf in the fall print. Lorie gave us different Christmas fabrics from a charm pack to choose from. 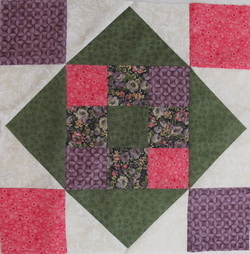 I chose a square that had green trees. 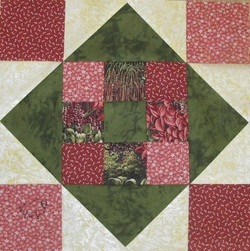 Some of my fabrics used are Christmas and others blend well with the other colors. 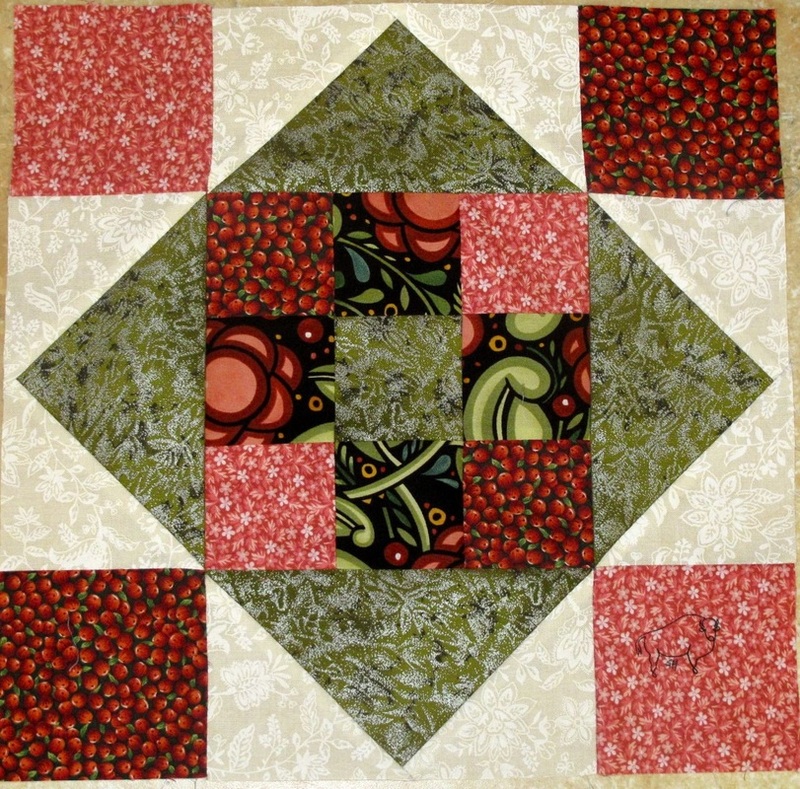 I hope she enjoys the block - my favorite fabric is the holly berries. 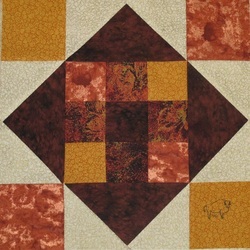 Ellen gave us a batik and plans on using another batik that is brown to sash and border the quilt. 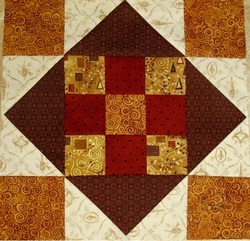 I was excited to see that the batik was one I had used in my bargello heart quilt. 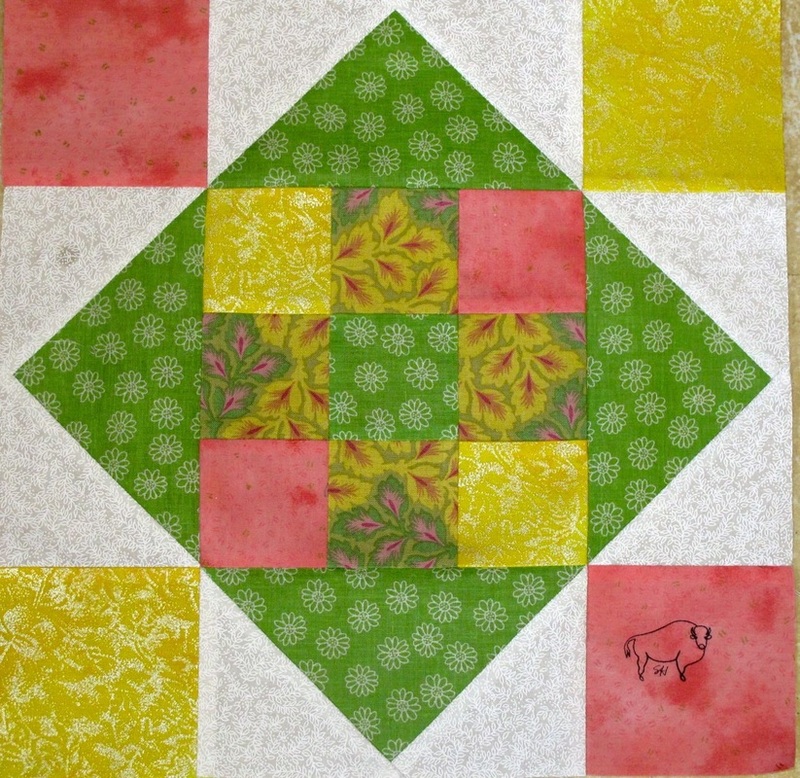 I added other fabrics that were also batiks that had various colors in the focus batik. I enjoyed this block a lot. Hope Ellen likes it. Jonie went to a lot of work to fussy cut snowmen for our focus block for her quilt. 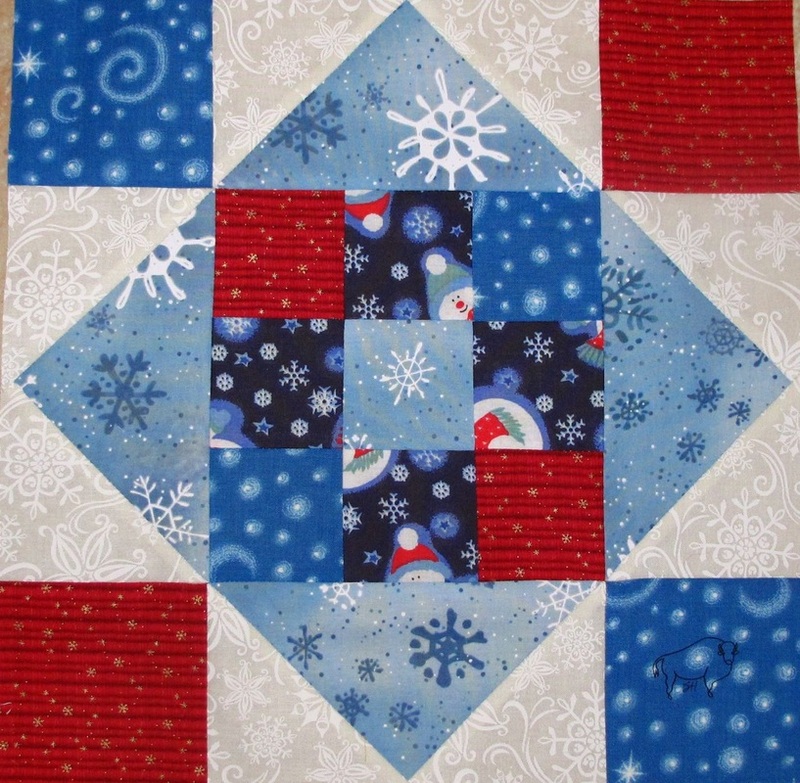 My pattern calls for me to cut up the 5" square so you have to look for the snowman. She wanted a winter quilt. I had several snowman fabrics but they all had Christmas holly or trees on them. 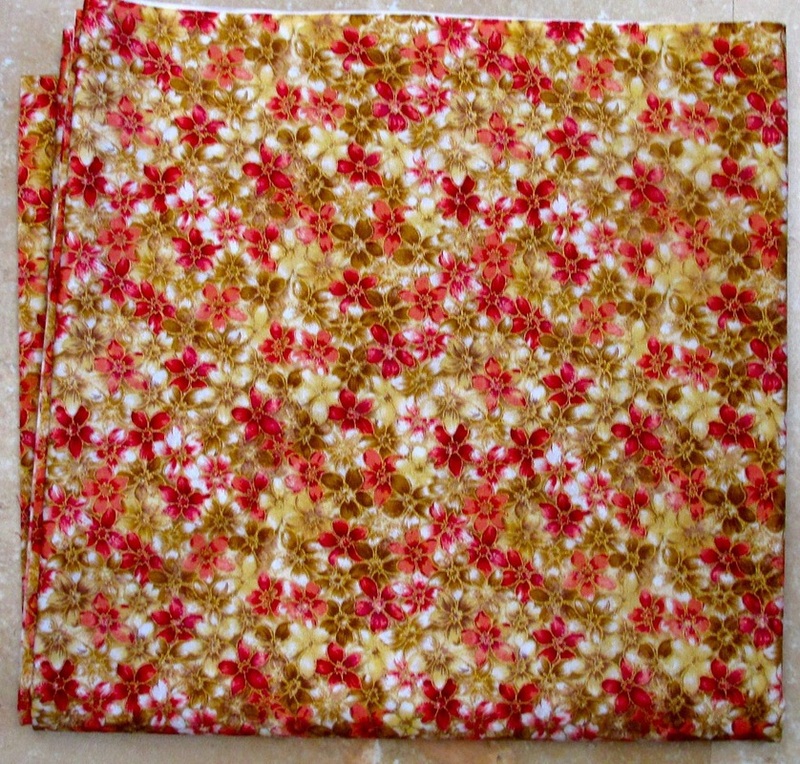 I did find some snowflake fabric - even the red fabric has gold snowflakes on it. This will be a great one to warm up with in winter. 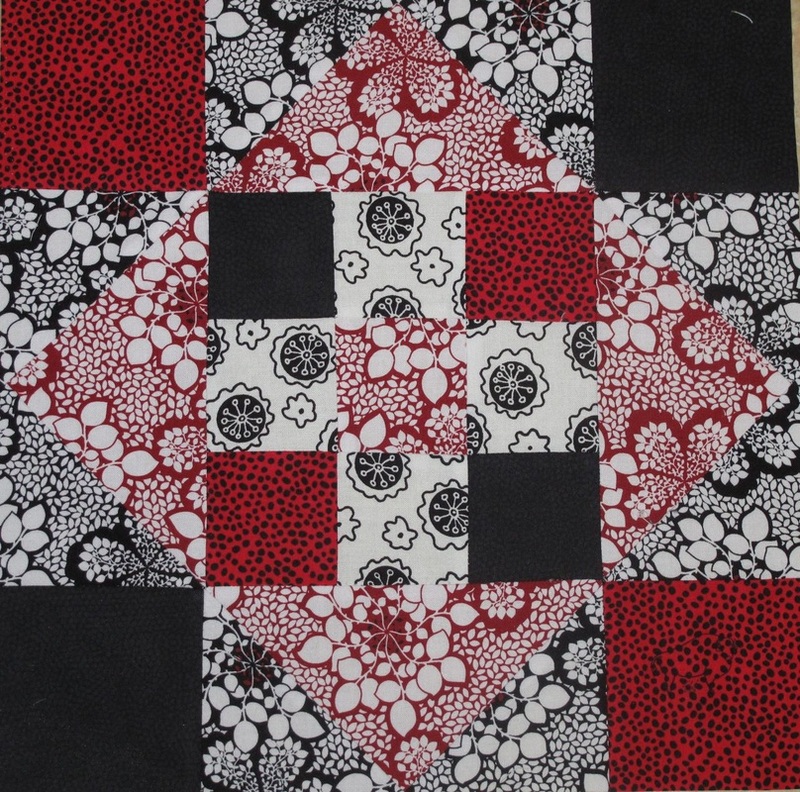 Vi's choice of floral focus fabric for the square will give members a chance to use a variety of fabric choices in their blocks. It is a light and whimsical piece. The pastels will make a beautiful quilt. Judy gave the group the white with black design print to use as our focus fabric. 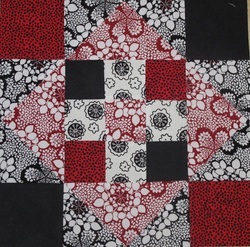 I had made some placemats for my daughter out of the outside red and black floral designs so decided they fit nicely with the focus. 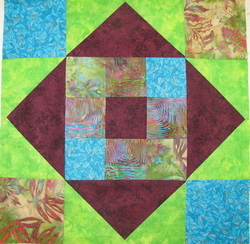 This will be a fun quilt because of the infinite color choice Judy gave us to work with. 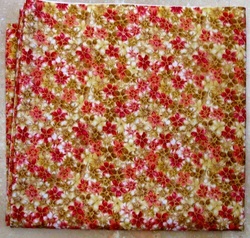 True to herself, JoAnn chose a batik fabric that fit very well with my personal stash of fabric. I love warm fall colors so had no trouble finding fabric to use. I like to add a metallic wherever possible and was able to find one that fit. 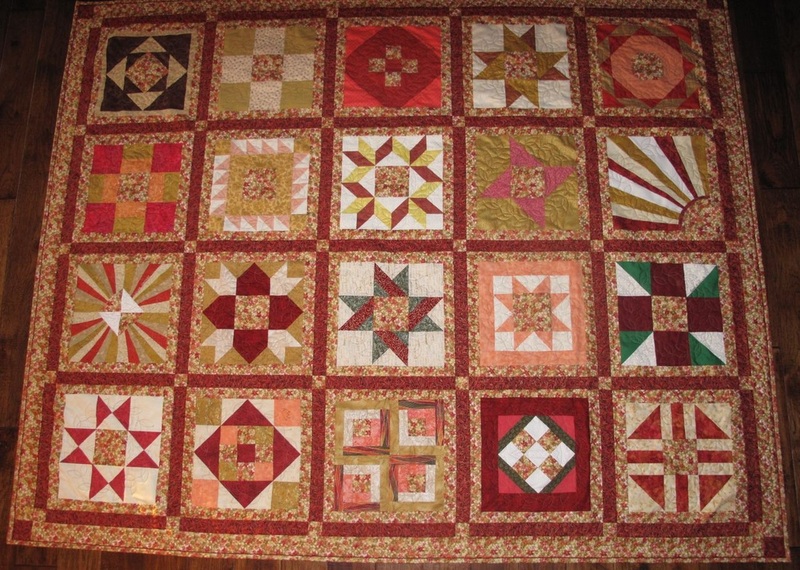 This will be a beautiful quilt. 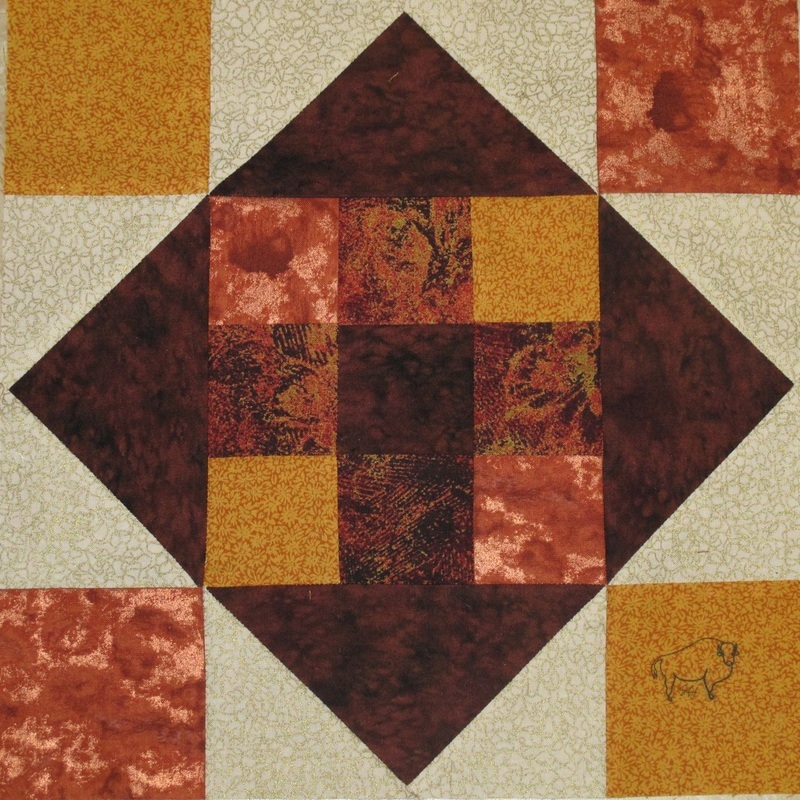 The batik was a wonderful springboard for this quilt. True to herself, Loretta chose a patriotic fabric for her focus. 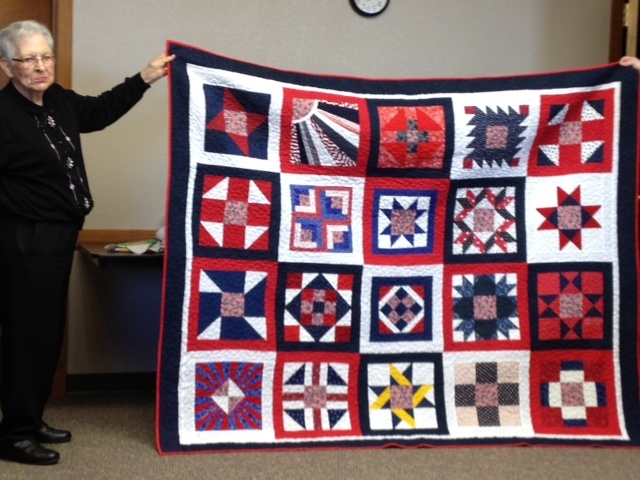 Loretta has been active in the Legion Auxiliary for many years. I chose two different reds plus a dark blue that seemed to have stars in it. 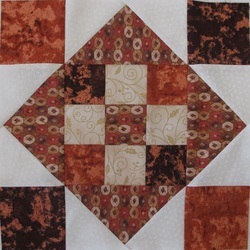 Kadi has chosen a charm pack with warm colors as the focus. Each of us will have a different fabric to work with. 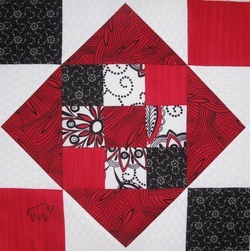 Kadi requests that we don't sign our blocks until she completes her quilt. Pennie chose a focus fabric that had complementary muted reds and greens. I discovered a little light yellow in my piece which enabled me to use some pale yellow Fairy Frost - adding the little bit of sparkle I like to use. 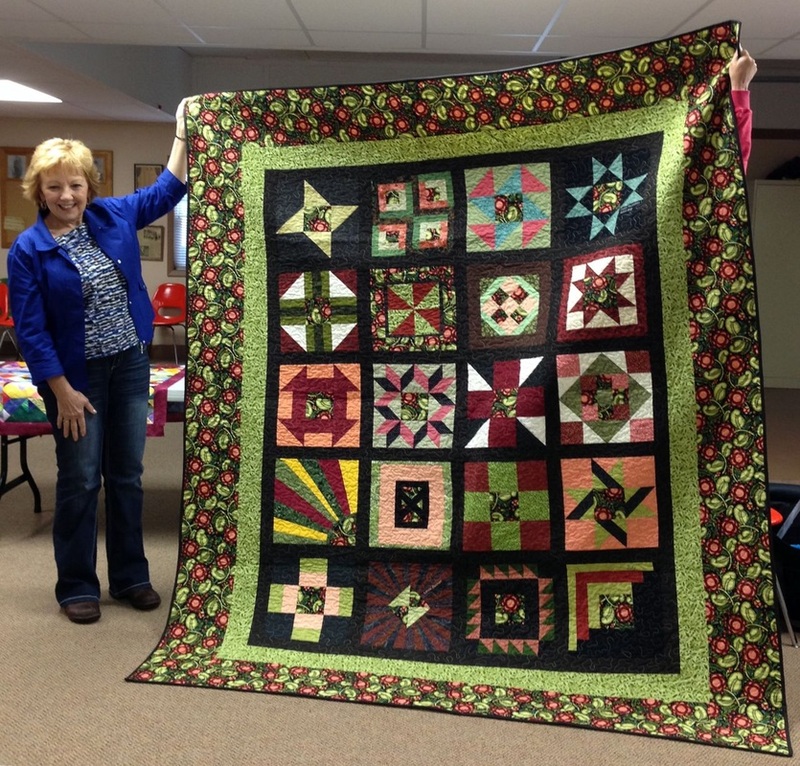 I am so excited to see what my birthday club quilting friends have come up with. It was both thrilling and hard to wait until this month. 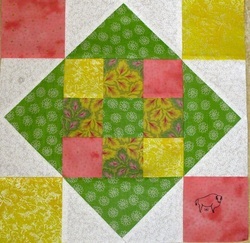 I first saw this fabric in Pennie Reese's "small" stash of fat quarters and thought it would make a great quilt. Tammy gave us a charm pack to choose from. When I sat down to make the block I couldn't remember for sure if it was to be a holiday quilt. I chose some metallic that has Christmas trees to make it more "festive". I stepped out of my comfort zone with this quilt block but I loved doing the pastel colors and plan on making a pastel quilt in the near future. Thanks, Taffy, for the nudge.